OpenText Corporation is a Canadian company that develops and sells enterprise information management software. Skillz Middle East is the leading service provider in the Middle East for OpenText Media Management (Digital Asset Management solution). We implement OpenText Media Management across the GCC (Bahrain, Kingdom of Saudi Arabia, Kuwait, Oman, United Arab Emirates) in corporate organizations, in SAP environment, integrated into ERP solutions, on-premise or on the cloud. OpenText Media Management gives you a superior, more intelligent approach to work. Oversee, make and utilize your digital media to brand your messages and your image in the majority of your correspondence channels to better engage in with your teams, your business network and your clients. It appears to be overpowering on occasion. We as a whole need more pictures, video and advanced media content. That implies the sum rich media is developing exponentially and speedier than we can process it or even appreciate. As a marketer did you ever acknowledge how a solitary picture – your hero shot – is utilized as a part of several distinct crusades, promotions, channels, and devices? Shouldn’t something be said about all the push to make that solitary best hero shot? Regardless of whether you’re a customer experience expert, creative guru, eCommerce executive, digital architect, brand doctor, the big chief or a marketing minion, you need to tame the computerized wilderness. OpenText Media Management is doing that for worldwide organizations over an expansive range of businesses – including media organizations, banking, financial organizations, retailers and best name brands and in addition museums and public services. You realize that DAM, done well, expands efficiency and gives better control of your content engagement and, at last, better results all over. Be that as it may, it isn’t just about Digital Asset Management (DAM). DAM is one a player in a greater trip in digital transformation. DAM exists together with numerous different innovations for marketing, business forms, and back office. OpenText Media Management is a piece of a product portfolio of innovative solutions including the Experience Suite, Process Suite, and Content Suite. Wherever you’re at in your digital journey, we’ll meet you there and enable you to advance. 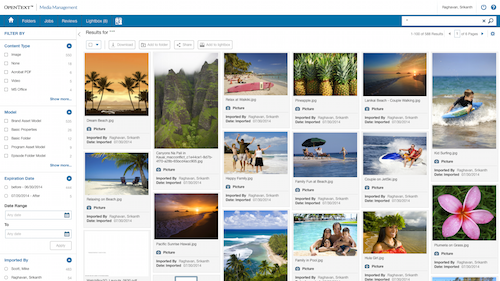 As a leading enterprise Digital Asset Management solution, OpenText Media Management is work process driven, multichannel capacities for creating, distributing, and sharing digital media and content through a safe, scalable platform. OpenText provides the strategic enterprise infrastructure, with key platform components and capabilities supporting the DAM ecosystem with the efficiencies of “create-once, use-many” to repurpose, re-express, reuse, and re-create. Happy clients have quantifiable gains in efficiency from automated, cooperative procedures and single, accessible vaults. Concentrating on our core competency and a platform to interconnect and incorporate with different solutions in the enterprise is a noteworthy OpenText differentiator. Responsive Design and Touch Enabled – Compatible with mobile and tablet view out-of-the-box. With up to 800 users and up to 2,500 assets being submitted daily, in addition to ongoing management of existing assets, it’s very important that we have productive processes. OpenText has all but eliminated unnecessary asset recreation. Our users can quickly locate assets and make needed changes within the OpenText system, helping speed up publication and keep costs low. OpenText Media Management won the prestigious 2016 CODie Award for “Best Digital Asset Management Solution”. The award recognizes the most innovative products impacting businesses across the world. Dynamic Content – Custom branded front pages based on user groups or roles. Brand attraction gives user groups a custom look and feel. “Widget” components let you customize the capabilities, such as drag and drop or add new assets or widgets which connect data from business applications. Speed Up and Simplify Collaboration – for Marketing and Agency on digital assets with review and approval workflows. Enhanced collaboration enables marketers to work together more effectively with their agencies, customers and partners for content production, review and approvals. Deep integration with the Adobe Creative Cloud applications – allows designers to work within their daily used applications and place images from OTMM as well as open and save Adobe InDesign files into the DAM directly. The integration provides low resolution and high resolution swapping of images to improve performance while working on layouts as well as maintaining of linked file relationships. Intuitive Search – Use facets to drill down and find what you need, use breadcrumbs to narrow your search result, suggestions, advanced search, saved searches, and recent searches. Utilize full-text search which is indexing also your document assets. Folder Browse – See all the assets with a preview independent of the format in a selected folder with the most valuable metadata. Add asset to the folder, subscribe to folder events and get notified of changes or additions in the folder.